The Cape West Coast with its bracing ocean, windswept beaches, endless views and dramatic sunsets is the perfect summer destination. Summer days through to the evenings finds the picture-perfect fishing village of Paternoster transforming into a landscape of breathtaking beauty. The Abalone House & Pool Villas, one and a half hours’ drive from Cape Town, is the ideal place to celebrate the arrival of this festive season. Spoil yourself and your significant this festive season with a relaxing massage or pampering body treatment at Abalone House & Pool Villas’s new and improved Spa this festive season. Upon entering the Spa at Abalone House, visitors are immediately transported to a brand new serene space echoing the eclectic and charming indoor spaces of both Abalone House and its nearby sibling Abalone Pool Villas. Pairing the whitewashed floors with deep blue walls replicates the seaside setting, while the bold statement created by the prints of renowned artist Tretchikoff elevates the newly revamped space to another level of enchantment. The theme is carried through in the calm treatment rooms, quiet and wonderfully cozy. 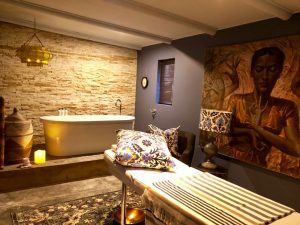 The introduction of world class Africology products and treatments at the Spa at Abalone House reinforces the 5-star boutique hotel’s status as the West Coast’s most sought after destination. Guest satisfaction is taken to the next level as guests of the Abalone Pool Villas now also have the choice of booking a treatment in the comfort of their own Villa courtesy of the Spa’s exclusive mobile service. This Christmas, treat yourself and your loved ones with a unique relaxing and tranquil seaside experience at The Spa at Abalone House. For bookings, call 022 752 2044 or e-mail spa@abalonehouse.co.za.